Helikopter were a Baltimore band, and their label, Hat Factory, was based in Baltimore. 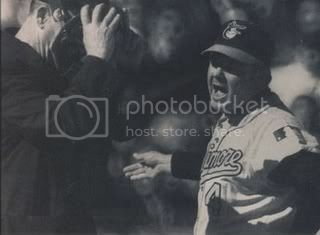 Other than that, there's no connection between Earl Weaver and Helikopter that I know of, but since I couldn't find anything about Helikopter on the web (much less a band photo), you get stuck with an Earl Weaver photo instead. 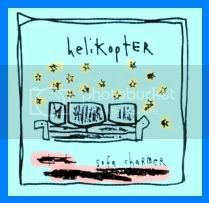 Much of the twisted, severely melodic noise kicked up on 1996's Sofa Charmer reminds me of the Lou Barlow songs on the first Dinosaur LP, while the calmer parts have an Honor Role feel to them (check out "Trigger Glo" and "Moth-ball", for starters). Pretty good for a band that didn't even stick around long enough to have a MySpace page. Generic Sports Blog Disclaimer: Since this is kinda the "off season" for hockey blogging, blah blah blah, I'm going to keep myself awake by highlighting a few of my favorite records here and there. None of these will be especially rare or anything, though I may get to some really good stuff eventually. They didn't stick around perhaps because they were all junkies. Aha! The truth is revealed. Someone please re-up these. I made the original comment, but I loved these guys. They lived in this house on York Ave. and one room was devoted to a turtle sanctuary. A mummified cat graced their wall in front of an antique hydraulically operated dentist's chair which apparently came with the house (as did the cat). It was great to snort some heroin while sitting on this chair, and then release the valve as the junk kicked in, and the scene would lower itself smoothly like panning the camera down in a film, sinking into a cool wet quiet abyss like a turtle into a pond. I have only one 45 of Helikopter, and no working record player. Is Morozov hiding an injury?